Provide comfort for the family of Ruth Lang with a meaningful gesture of sympathy. Passed away in her 77th year. 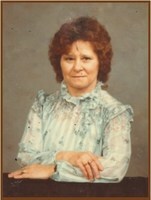 Wife of Wesley "Sonny" Chester. Mother of Roy, Ann "Susie" Mittleholtz (Cricket) and Mary Lamoureux (Marcel) all of Sault Ste. Marie, Ontario. Daughter of the late Elmer Cuthbertson and the late Grace Bordeleau. Sister of the late Norman Cuthbertson (late Evlyne), late Louise Lapossie (late Elmer), late Betty Lou Ervin (late Jack), late Wendell, late Cecil Cuthbertson (Charlotte) and Greg of Sault Ste. Marie, Ontario. Grandmother of 5 and great grandmother of 4. Family and friends are invited to O'Sullivan Funeral Home and Cremation Centre (corner of Cathcart and St. James St) on Thursday Febraury 14, 2019 from 6-8 p.m. A burial will take place in the spring. In lieu of flowers, donations may be made to the charity of your choice. To send flowers in memory of Ruth Jean Lang (Cuthbertson), please visit our Heartfelt Sympathies Store. Tom and Joyce Jackson Family-Joyann,Rob,Jarren,Jel sent flowers to the family of Ruth Jean Lang (Cuthbertson). Dear Sonny and Family We are saddened to hear of Ruth passing on. Our most sincere condolences. I am so sorry for your loss,she was a very caring person.She will be missed by so many.Sending Prayers to all the family and friends. Tom and Joyce Jackson Family-Joyann,Rob,Jarren,Jel purchased the The FTD Deepest Sympathy Arrangement for the family of Ruth Lang.